For several years now manufacturers of smartphones have discussed the design and development of smartphones that would bend. Now, thanks to Lenovo, they’re really here. And they’re not just flexible in the sense that they’ll curve slightly to accommodate the shape of your rear once they’re deposited in your back pocket. 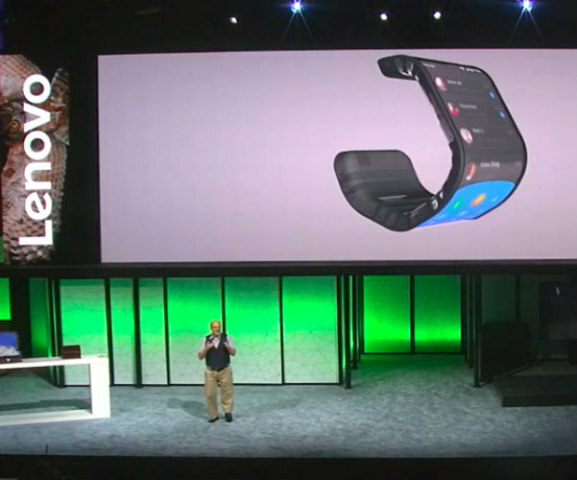 These new bendable phones can literally be turned into a wrap that can be worn as a bracelet, as demonstrated at Lenovo's Tech World conference today (held in San Francisco) by YouTube personality Meghan McCarthy. The phones themselves are pretty unassuming in appearance until they’re turned into slap bracelets and then the wow factor kicks in. Peter Hortensius, Lenovo’s SVP and CTO, spoke to the audience at today’s gathering and told them that not only do their new phones feature bendable screens, but they also have bendable internal components such as motherboards and batteries — which would only make sense, because otherwise how would they attain such flexibility? This has been a dream for sometime with a lot of folks — that, and waterproof phones or phones with unbreakable screens (which finally came to fruition). Want your tablet to be every bit as flexible? No problem. The group showed off a tablet that can be folded in half like a brochure or a menu and used to make or take phone calls or slip into pockets or what have you. Tablets have already made transporting computers around even easier than lugging around lightweight laptops, but with this new bendable technology your tablet can be slipped into the pocket of your cargo pants or inside jacket pocket for an even more flexible user experience. This is actually pretty exciting news for people who can’t bear to be separated from smart devices. As of this writing, the group has yet to announce any potential release dates or pricing for their new flexible electronic devices, but Peter Hortensius did make reference to the fact that Meghan McCarthy might want to be careful with them due to the fact "they cost a little bit more than your average phone or tablet right now." This really isn’t surprising, because surely nobody expected them to be cheap initially. It doesn’t really matter, because people that live for the latest gizmos and gadgets technology has to offer will undoubtedly stand in line for hours or even days on end to be the first to have them. Samsung strove to announce their own bendable electronics first with the announcement a few days back of their foldable smartphone and foldable smartphone/tablet combo using OLED screens. While they do bend, they don’t appear to have the same kind of flexibility as the Lenovo products. The rumor is that their devices may be available as early as spring 2017, but no official release dates have been announced for them, either. Between the two groups, Lenovo’s electronics will probably garner more interest from consumers due to their extreme flexibility. All in all, both companies are moving beyond prototypes and looking to make this technology a reality now.